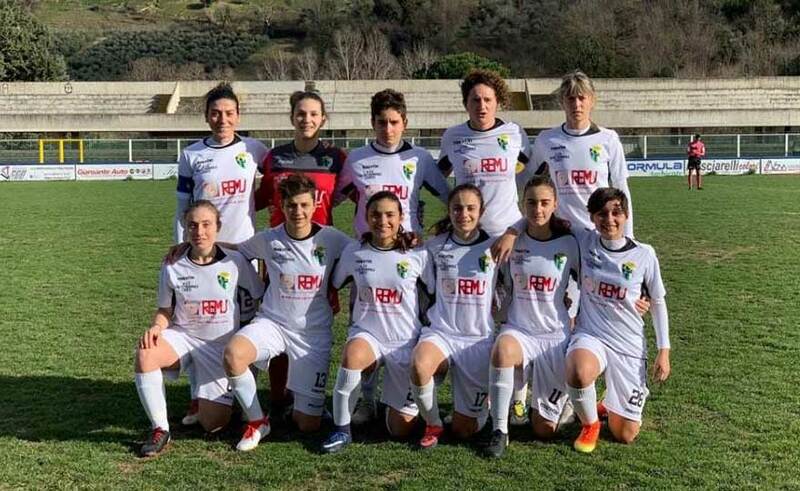 The Chieti Calcio Femminile continues its positive wake and beats 3-2 the Vapa Virtus Napoli at Angelini thanks to the networks of Scioli, Giada Di Camillo and Vukcevic. The neroverdi date back in the standings taking to 12 points with a game to be recovered against the Power in a single stroke Apulia Trani and Aprilia Racing Female. The game was exciting with the two teams who have fought openly. The Vapa is determined to make a result and the neroverdi eager to win a precious victory: this is the leitmotiv of a race that has enthralled the public. On the 2-2 the victory seemed to fade, but a masterpiece of technique and stubbornness of Vukcevic has given the theaters three points that are yet another injection of confidence for the future also in view of the next derby with Pescara scheduled for next Sunday. The match opens with a great fear: at the 4 'hard air battle clash between La Mattina and Carratu with the neroverde that has the worst and is brought to the edge of the field leaving the Chieti in ten. At the 12 'we try Di Sebastiano in turn and blocks Leone. Two minutes later La Mattina must permanently leave the field replaced by Colecchi. At 20 'D'Avino strikes a resounding internal pole directly on a free kick with the ball back on the field for luck of the neroverdi. Still Vapa in attack with De Rosa who tries from outside, high ball. First occasion for Chieti at 24 'with Vukcevic on the set piece, the ball flies over the crossbar. At the 32 'the neroverdi go ahead: Gangemi stubbornly retrieves the ball in the defensive phase, launches forward for Scioli that protects the ball well, frees with force of a defender and beats Leone out. At 38 'Vukcevic rolls from outside the area, but the ball fades weakly in Leone's arms. You go to rest on the 1-0 for the hosts. At the 2 'of the second half the Vapa equalized with a great shot from the rebound from outside the D'Ambrosio area, which came in at the beginning of the second half in place of De Rosa. At the 6 'Chieti returns to the lead with the captain Giada Di Camillo who steals the ball from the visiting goalkeeper in the whole area and from the ground manages to put on the net. At the 14 'Vapa is the new draw with a great shot of Fiacco passing between a forest of legs and slipped in the far corner with Falcocchia touching the ball but unable to avoid the network. At 22 'Forcella, entered instead of Di Domizio, was stopped in a dubious offside position between the neroverdi protests. At 26 'Scioli recovers the ball, flies towards the door, but pulls incredibly out of a good position. A wild Forcella at 33 'retrieves an excellent ball, pulls from the edge diagonally, but Leone blocks with confidence. At 39 'Chieti comes to the final advantage: goal Vukcevic's masterpiece that gets rid of a pair of defenders, is focused and puts the ball at the intersection on the far post. Open applause for the great prowess of the attacker. Nothing happens until the referee whistle: the neroverdi run under the stands to celebrate a victory that raises them in the standings and gives even more morale to the team. Chieti: Falcocchia, Di Camillo Giada, Di Santo, Benedetti, Vukcevic, Di Sebastiano, Gangemi, La Mattina (14 'pt Colecchi), Scioli, De Vincentiis, Di Domizio (26' st Forcella). Available: Gritti, Lacentra, Coscia. Vapa Virtus Naples: Leone, Apicela, Ruoto, Fiacco, Ferrara (43 'St Salerno), Carratu (9' St Russo), De Rosa (1 'St D'Ambrosio), Galluccio, Di Marzo, D'Avino (43' st Galdiero), Esposito. A disp . : Boccia. "We played a good game, are three fundamental points that allow us to overcome other teams in the standings, we are now quieter. There is also a game to be recovered. We do not look too much at the rankings, however, we want to think Sunday for Sunday to win other positive results. Returning to the match against Vapa, on the 2-2 we are a bit 'hot, I was a bit' scared, but we were good to keep the result and score a third goal with beautiful Vukcevic. I would like to underline the stubbornness of our captain Giada who on the second network believed us to the end by stealing the goalkeeper's ball and scoring. On their second goal I touched the ball, but unfortunately entered the net: I have not seen the action well, but I think one of us has lowered and the ball is so passed. This is the victory of the group: we are more and more united between big and small and we are finding the right amalgam. I want to say good luck to Samantha La Mattina, hoping it's nothing serious. We expect a derby to win, a game that will be difficult, now let's not think about it because we want to enjoy these three important points and in the week we will work in view of this new commitment ".